Cobalt (Co) (atomic number 27 and atomic weight 58.94) has density of 8.85 gm/cc. Melting point of Co is 1493 deg C and boiling point is 3100 deg C. At temperatures below 417 deg C cobalt exhibits a hexagonal close packed structure. 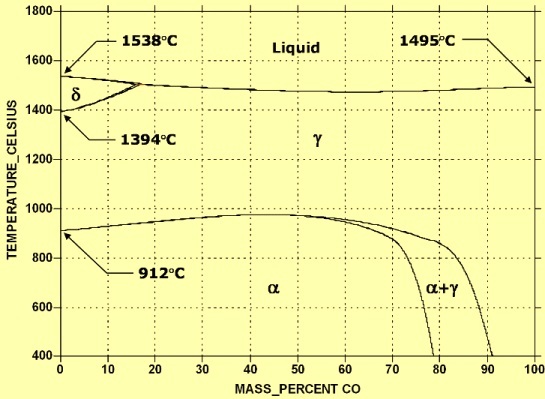 Between 417 deg C and its melting point of 1493 deg C, Co has a face centered cubic (fcc) structure. Co is a magnetic metal with a curie temperature of 1121 deg C.
The phase diagram of the Fe-Co binary system and is given at Fig 1. Co is not a popular element which is commonly added to alloy steels. It does have some effects but these can also be achieved with other alloying elements such as molybdenum (Mo), and nickel (Ni) etc. at lower costs and mostly with better results. Due to this factor, Co does not find enough use in high tonnage low alloy steel production. However it does have some niche markets in steel. Co becomes highly radioactive when exposed to the intense radiation of nuclear reactors, and as a result, any stainless steel that is in nuclear service will have a restriction in the Co content which is usually around 0.2 % maximum. In the production of co bearing alloy steels, additions of Co during the steel making is made in the form of Co metal which is supplied to steel producers in the form of briquettes, granules, and broken electrolytic cathodes. Content of Co in these additive agents is usually in the range of 98 % to 99.9 %. Scrap of super alloys normally contains high percentage of Ni and hence is not used for the production of tool steels. However this scrap can be used for the production of maraging and ultrahigh strength steels. The metallurgical behavior of Co is similar to that of Ni and hence oxide of Co is readily reduced in all but the most oxidizing steel baths and may be added to the electric arc furnace or the AOD(argon oxygen decarburization) furnace. More common practice in tool and alloy steel production, however, is to melt down a high scrap charge and then adjust the final Co content with the addition of Co metal. Vacuum melting is also employed for the production of steels with Co additions. High speed tool steels containing Co are treated in a similar way as Co free alloy steels. Since the composition of these highly alloyed steels is quite complex, these steels are susceptible to heavy segregation. Hence these steels ordinarily require massive amounts of hot reduction to break up the cast structures. These days with the development of powder processes in combination with hot isostatic pressing (HIP process) techniques, these processes have become more preferred route for the production of high speed tool steel containing Co.
Solubility of Co in the ? iron is up to 75 % while in the ? iron it is unlimited. Co is the only one alloying element that increases the critical cooling rate of steel and accelerates pearlitic transformation thus reducing hardenability. Co is unique among alloying constituents in steel in that it is the only element that has negative effect on the hardenability of steel by accelerating the decomposition of austenite. It has a tendency to graphitization and is a very expensive component, hence it is not used as an alloying addition in normal steels. It is never used in the standard heat treatable steels. Co is, however, a constituent of maraging and 9Ni-4Co ultrahigh strength steels but here, its presence is overcome—from a hardenability standpoint—by the remaining alloying constituents. Since Co has a negative effect on hardenability, it affects the hardening less than other elements. The presence of Co in the steel improves its durability and hardness at higher temperatures, reduces the fall in hardness of austenite and ferrite under the influence of temperature increase, and therefore is used as a supplement to some grades of high speed steels and tool steels. It is also a component of creep resistant steels. Co is a valuable alloying element for high speed tool steels. It has the effect of raising to softening temperature of ferrite so that tools made from Co bearing alloy steel can operate at high temperatures, maintaining their cutting capacity. Co has few, but highly specialized, uses in alloy steels. Its behavior is similar to Ni, in that it forms a complete series of solid solutions with iron at elevated temperatures and is also extremely soluble in ferrite. It is a potent ferrite strengthener; this solid solution strengthening persists to quite high temperatures, and hence Co is used in several grades of high speed tool steels, among others. Co is ferromagnetic like Ni and has magnetic permeability. Co increases hardness and allows for higher quenching temperatures during heat treatment. It intensifies the individual effects of other elements in steels with complex compositions. Co is not a carbide former. However addition of Co to alloy steels allows for higher attainable hardness and higher red hot hardness. The Co matrix has a high-work hardening sensitivity, which combines with the carbide fraction and allows to achieve excellent wear resistance associated with a high degree of corrosion resistance. Co raises the A3 temperature in tool steels, thus calling for somewhat higher austenitizing temperatures. This is beneficial in that it forces a greater degree of dissolution of the complex carbides these materials contain. Co does form a carbide of the Fe3C type, but this compound does not contribute to secondary hardening. Co is used in a series of magnetic steels, It is an important constituent of the 18 % Ni maraging steels and several other ultrahigh strength steels and is added to one grade of austenitic stainless steel. In order of decreasing tonnage usage, primary applications of Co are in non-ferrous (super)alloys, magnets, high speed tool steels, ultrahigh strength alloy steels, abrasion-resistant cemented carbides for cutting tools and stainless steels. Magnetic steels containing from 9 % to 40 % Co have been used for compass needles, hysteresis motors and electrical instrumentation. Cobalt is added to high speed steels to improve hot hardness. It is found in both Mo and tungsten (W) grades of tool steels. Co bearing high speed steels have a somewhat greater tendency to decarburization and are more sensitive to cracking when exposed to abrupt temperature changes. They are also somewhat more brittle than non Co grades. However, their increasing popularity is due to their excellent red hardness property. The addition of Co to cold work die steels (as in steels with 3 % Co) increases hardness and promotes greater wear resistance than grades where it is not used. Likewise, hot work die steels may contain about 0.5 % Co for better wear resistance and higher hot hardness. The chromium-bearing grades contains up to 4.25 % Co for this reason. Maraging steels containing Co have found many uses where their strength coupled with workability have got them the application over possibly stronger materials. These ultrahigh strength alloy steels are commonly heat treated to yield strengths approaching 2070 MPa and have excellent toughness as well. Their primary application is in aircraft and aerospace and military industries. Typical applications are landing gears, arrestor hooks, torque shafts, rocket motor casings, gun barrels, bolts, fasteners, extrusion arms etc. Co is used in stainless steel of grade 348. It contains 0.20 % of Co.